The report addresses such topics as economic stimulus, long-term infrastructure investment, drinking water standards, source water protection, climate change, and system security. According to the AWWA article, it specifically asks for “dedicated funding” for water infrastructure in any economic stimulus package, “dispersed in such a way as to be quickly accessed by utility managers, with a minimum of delay and ‘red tape.’” It calls the $1 billion included in the earlier stimulus package “a good start,” but says that “much more money is needed” to fund the wide range of projects nationwide that have been affected by the credit crisis. It advocates equal funding for drinking water and wastewater projects. The report rejects “any proposal” of a federal water tax, charge, or levy against either utilities or customers. The impact of climate change on drinking water resources should be addressed with dedicated funding for research and to help utilities adapt to the changing demands climate change may bring, the report recommends. 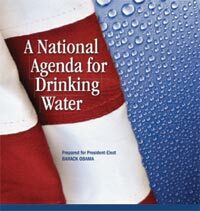 •subject water utilities to regulation by multiple federal agencies. It also asks for protection of “sensitive data regarding water utilities” and that any new federal security mandates be accompanied by federal financial assistance. In response to a question from Water & Wastewater News about what priorities President-elect Obama should have now, a National Association of Clean Water Agencies (NACWA) spokeswoman said, "Right now, we're focused on getting an economic stimulus package enacted. It will and should be a priority if we don't get one enacted in the next two months." NACWA represents wastewater treatment facilities. Susan Bruninga, who is director of legislative and public affairs at NACWA, also told WWN that her association believes the stimulus package should include $10 billion for wastewater infrastructure projects. Extrapolating from the experience of the transportation bill, Bruninga said that every $1 billion creates about 47,000 jobs.